With this in mind, consider the example of a couple in New Jersey who goes online to the website of a California firm to buy a product made and shipped from New York State. Where is the point of sale? Which state can claim to have the most substantial nexus? In which state are the most taxpayer supported services provided as related to this sales ransaction? These are questions for those drafting the Market Place Fairness Act to consider. If raising state revenue was the primary consideration, each state might decide to impose their own sales tax in the above example. This situation would discriminate against interstate commerce. More importantly, if raising state revenues is the issue then the obvious places to start would be the elimination of tax loop holes and sweetheart deals for businesses, elimination of the ridiculous tax loopholes for wealthy individuals, and maybe raising taxes on those who financially benefit the most in New Jersey. Sales taxes are already far too regressive and burdensome to the poor. Beware America! The push is on for yet another round of self-serving corporate tax reform. A press release from the Business Roundtable announced the release of a new report touting the economic benefits of “revenue neutral” corporate and individual tax reforms. Below is a summary of the findings from the press release and a link to the report. 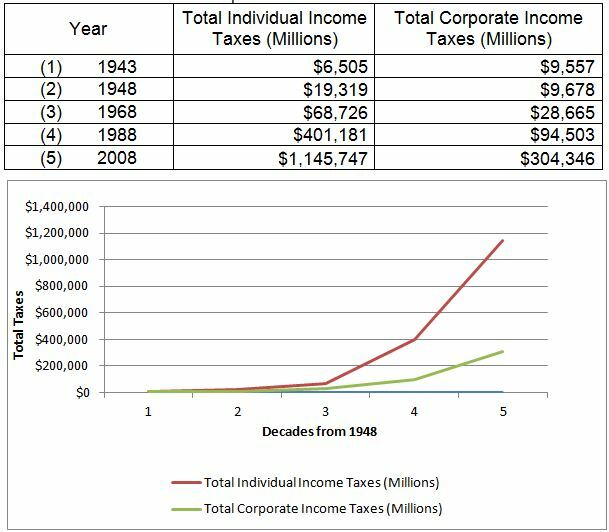 But before you read it, consider what the real trend is in corporate tax revenues compared with what individuals contribute. HERE IS THE TRUTH! Corporate tax rates do not reflect what corporations actually pay in income taxes, and the effective corporate tax rates, as well as the percentage of tax revenues they contribute have been in decline for decades. The table above (in millions of dollars) is based on statistics from the Office of Management and the Budget in the White House [www.whitehouse.gov/omb/budget/Historicals/]. Shifting the tax burden from corporations to individuals over the past 40 years is yet another factor contributing to the current decline in domestic consumer spending. Wage suppression, the shifting of the tax burden from the rich to the middle class, coupled with the decline in the tax burden on corporations are all that is needed to explain the decline of America’s middle class, the rise in poverty and the growth of government spending in social support programs. The people are going broke, the government is going broke trying to prop us up and the rich are becoming richer and more powerful each year. U.S. Companies’ Fiercest Competitors Enjoy Lower Home-Country Tax Rates: It is well known that the U.S. combined (federal and state) statutory tax rate is the highest of any developed nation, averaging 39.1 percent. As the analysis points out in detail, American companies now find that their closest foreign competitors are based in countries with lower corporate tax rates and international tax systems more favorable to their global operations than the U.S. rules. Since 2000, 30 of the 34 Organisation for Economic Co-operation and Development (OECD) countries have reduced their corporate tax rate. High Rates are a Drag on the U.S. Economy: Researchers at Cornell and the University of London report that a one-percentage-point decrease in the average corporate tax rate would result in an increase in real U.S. GDP of between 0.4 to 0.6 percent within one year of the tax cut. Double Tax on Foreign Earned Income Hurts American Companies and U.S. Competitiveness: Within the OECD, of companies headquartered outside the United States, 93 percent of the world’s top 500 companies (based on Fortune’s 2012 list) are headquartered in countries that use “territorial” tax systems, where income earned abroad is not taxed again when earnings are repatriated, unlike under the current U.S. system. This is up from only 27 percent of the same countries utilizing territorial systems in 1995 – signaling a significant trend towards the more competitive method of taxation. Under current law, foreign earnings are effectively “locked out” of the United States: An estimated $1.7 trillion in accumulated foreign earnings was held by the foreign subsidiaries of American companies in 2011. If only half of that amount came back to the United States in response to enactment of a market-based territorial tax system, the funds freed up for use at home would exceed the increased government spending and tax relief provided under the 2009 American Recovery and Reinvestment Act. Effective U.S. Corporate Tax Rate 12+ Percentage Points Higher than OECD Countries: Data in the new document disproves claims of low “effective” rates (amount of tax paid after deductions) paid by U.S. corporations, citing a new World Bank study of corporate income taxes in 185 countries for 2013 that finds that tax payments are higher for companies operating in the United States as a percentage of income than the average of other OECD and non-OECD countries. In fact, the U.S. effective tax rate (ETR) of 27.6 percent is more than 12 percentage points higher than the average of other OECD countries and 11 percentage points higher than the average of non-OECD countries. The analysis also explains why using the ratio of corporate income tax to GDP is an improper measure of effective rates. U.S. Workers Bear the Burden of the Outdated U.S. Corporate Tax System: Corporate Tax Reform – The Time Is Now also analyzes a number of recent studies that find that workers bear between half and three-quarters of the burden of the corporate income tax. These findings suggest reducing the corporate income tax rate would provide benefits to workers through higher wages. God! When are we going to wake up?